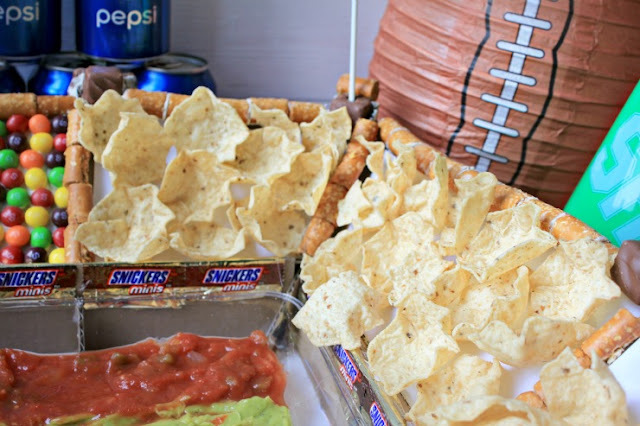 I love a challenge and you know how much I love football so when I was challenged to create a snack stadium out of candy and chips, I jumped on the chance. I had seen snack stadiums before on Pinterest but they were all made out of sandwiches and cold cuts so I had to get my brain into high gear to come up with a design. 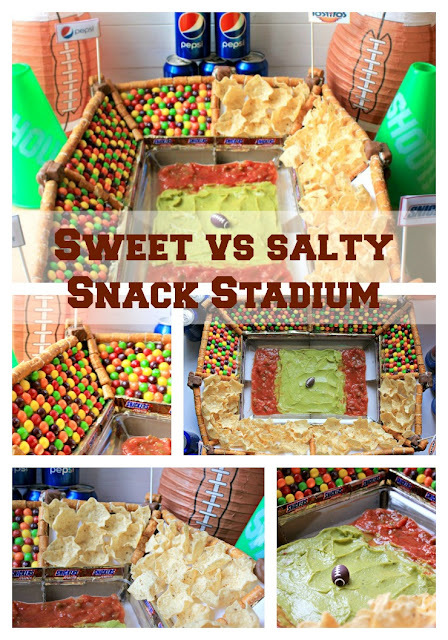 It took a whole weekend to create but I am thrilled to present to you my Sweet vs Salty Snack Stadium that's a perfect addition for all your big game parties! Pretty cool, huh? I have both sweet and salty fans in my home so this stadium fits in perfectly into our party menu. My favorite part, most of this stadium is edible!! Want to make a salty vs sweet snack stadium for your next party? Well, I took lots of pictures of the assembly and posted them below. 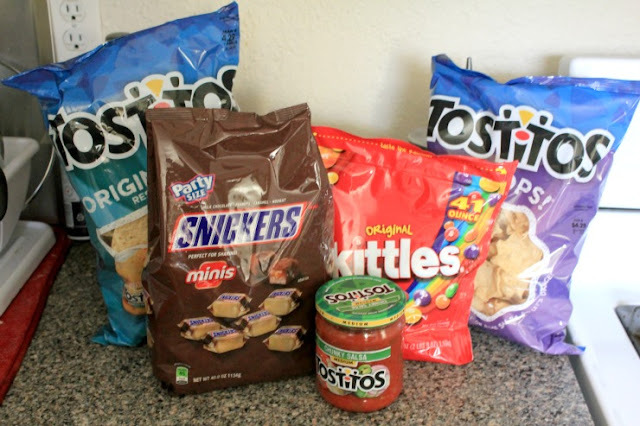 First up, you need to purchase your salty vs sweet snacks: (2) SNICKERS® Minis 40oz bags, Skittles® XL 41 oz bag, TOSTITOS® Scoops and TOSTITOS® Original chips Party Size (I wasn't sure which I would be able to use so I purchased both, TOSTITOS® Medium Chunky Salsa, some guacamole for the your field and a rolled type snack for the stadium border. To begin, glue the plastic rectangular platter to the center of your foam board base. 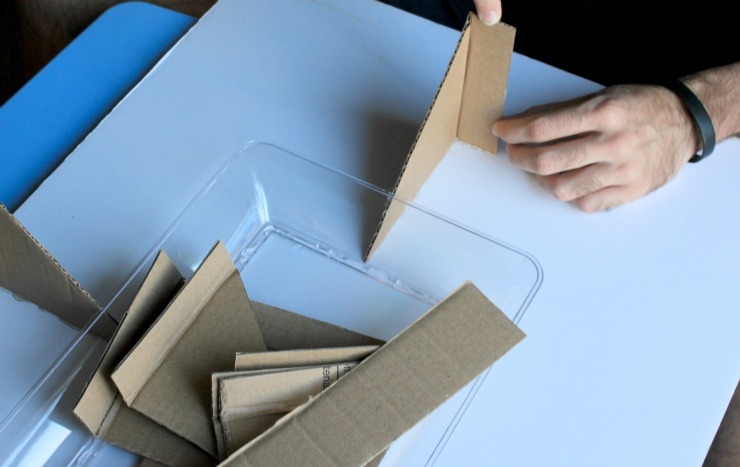 Next, you are going to measure and cut your cardboard. 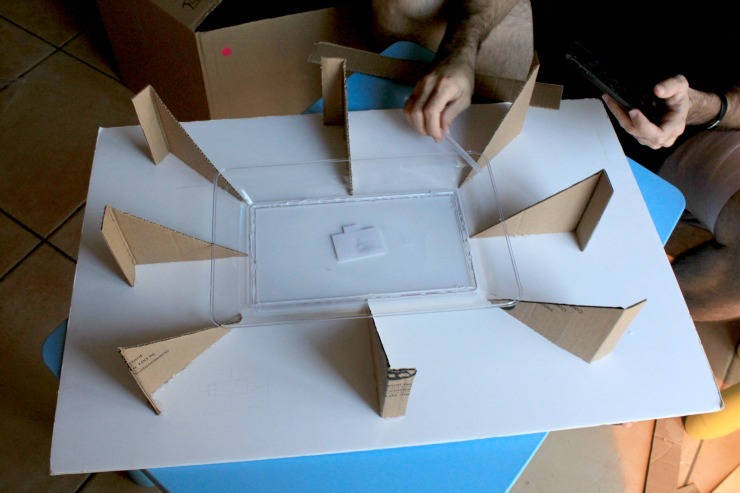 You will need to start by cutting angles to the height you wish your stadium to be. My angles were about 6 SNICKERS® Minis tall. Seriously, this was how I measured. You will need 8 angles. Glue 6 angles to the corners of the plate and then 4 angles in between at the centers. Next, you will need to cut out the "seating" walls that go between the angles. My walls were about 5-1/4 inches wide by 4 inches high. Glue your "seating" walls to the angles. 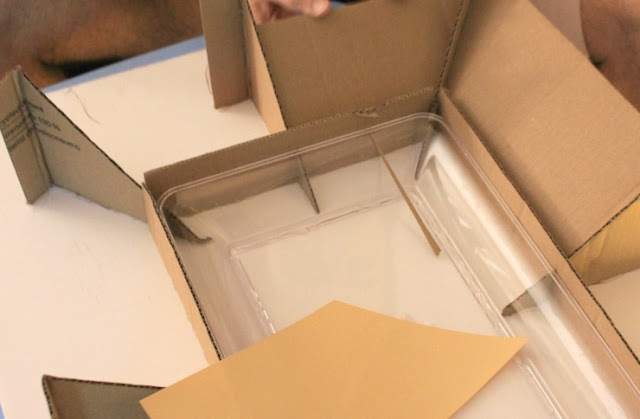 Then you need to make base walls. These go under the "seating" walls as support. Glue these walls to the back of the "seating walls and to the foam base. 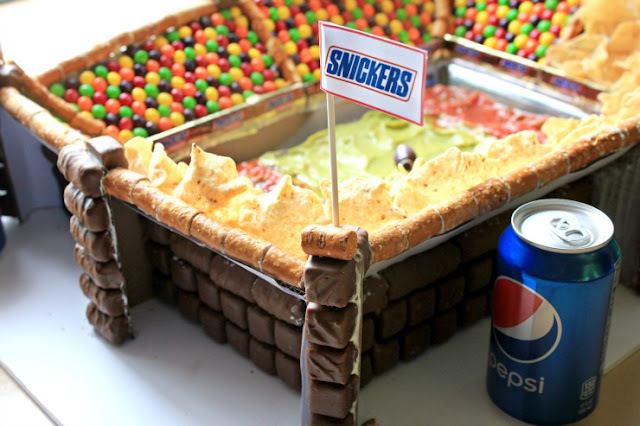 Now you have a stadium and you can start the fun part, adding candy. 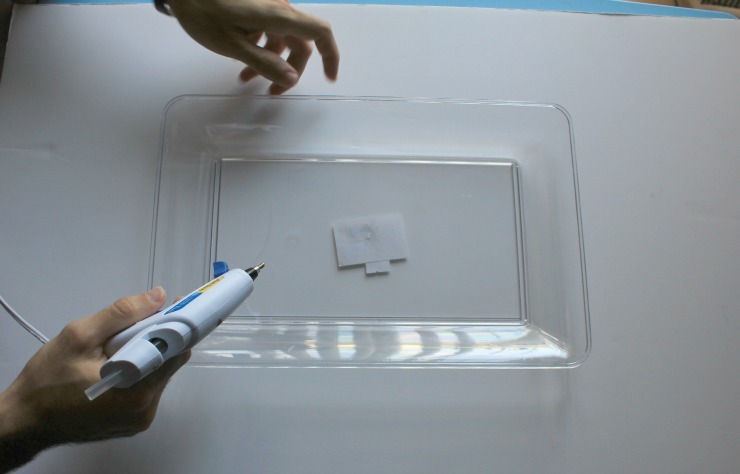 Actually, I wiped down the board with a damp cloth to remove any dust and particles, you know just in case. First candy you are going to use are the SNICKERS® Minis. 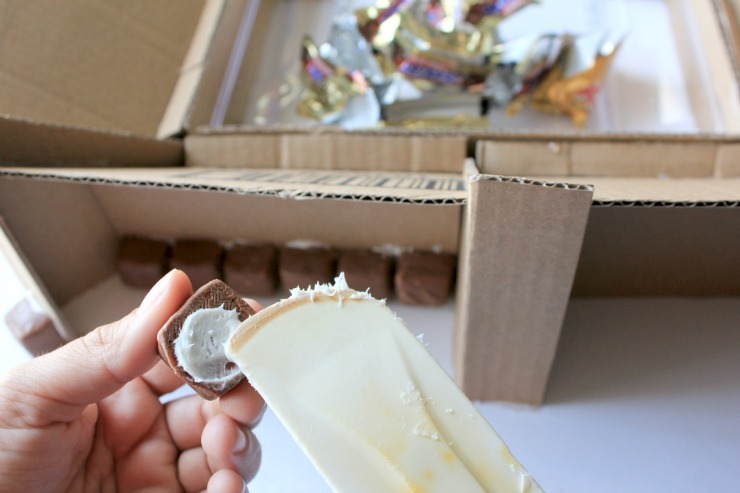 Spread frosting to the back of the candy bar and stick to the outside base walls of your stadium. Continue all the way around. All of the stadium base will be covered with SNICKERS® candy. Next, examine your base. 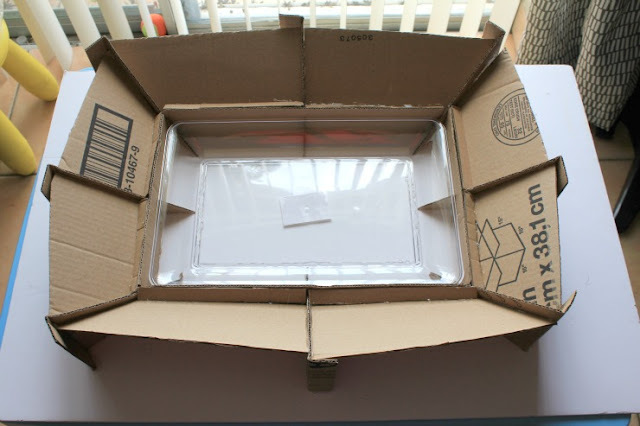 Any cardboard still showing should now be covered with white copy paper. 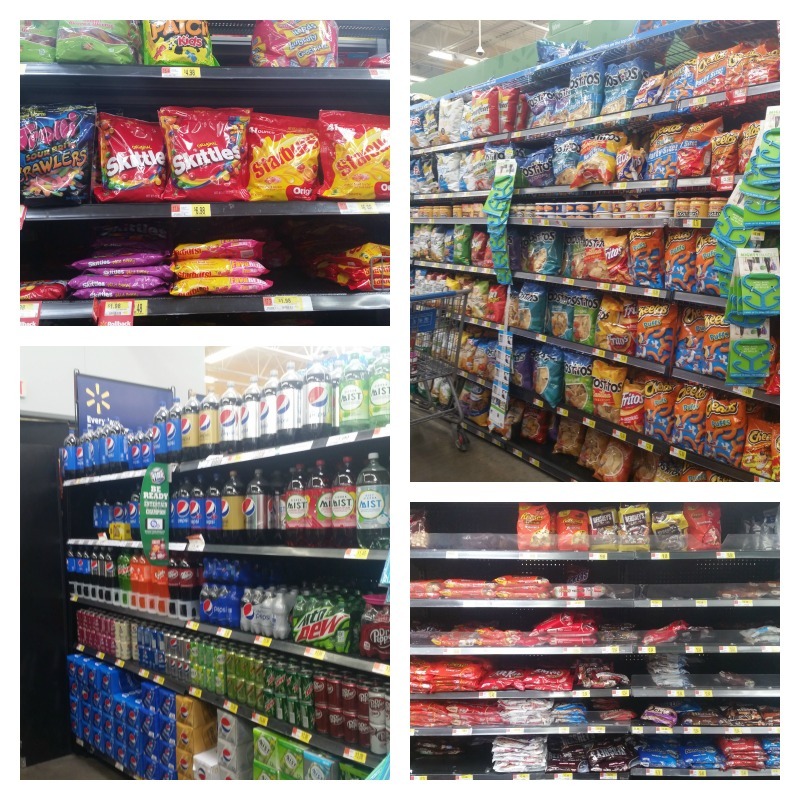 You can also add more candy but I covered mine with paper and it looked amazing. 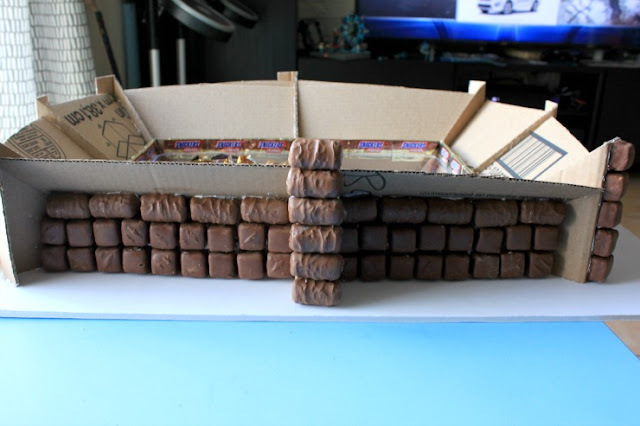 Also, I wanted a sponsor wall like actual stadiums have so I used some of the wrappers from my SNICKERS® to create a sponsor wall along the inside of my stadium. All I did was glue the wrappers to the exposed cardboard wall along the rectangular plate. Time for Skittles®! 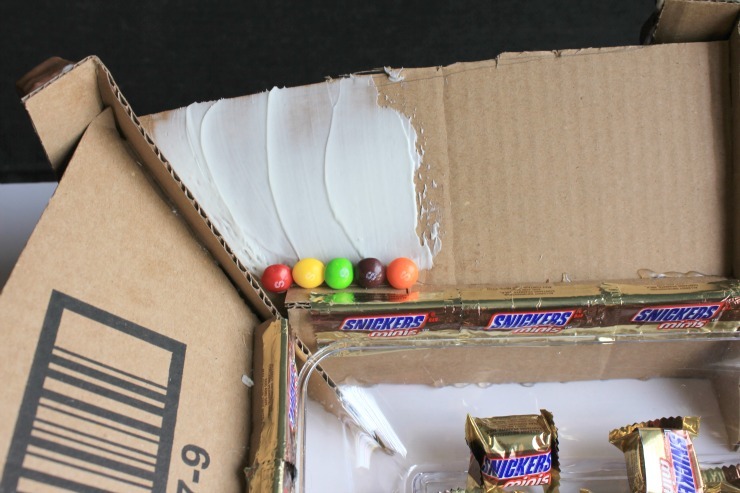 First, cover a section of your "seating" walls with frosting. Then you just lightly press down a Skittles® candy on the frosting. Repeat until the whole section is covered. As you can see, I started with a pattern but quickly got lost along the way. 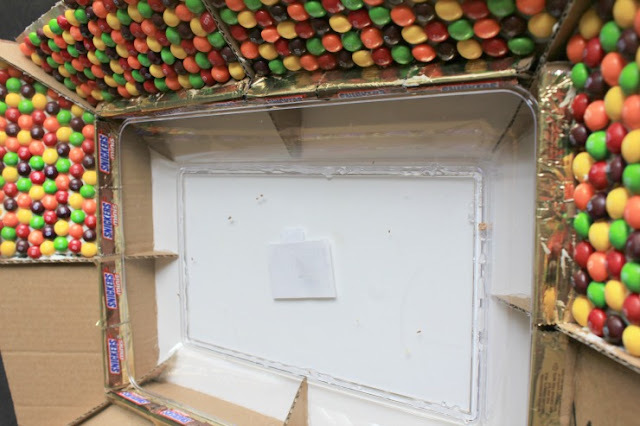 I used A LOT of Skittles® candy but hey, I wanted a big audience! Add Skittles® to half of your stadium. My friends you should now be relieved to know that assembly is almost over. On the salty side, I covered the exposed cardboard with white copy paper and just placed the chips (placed not glued, no one wants glue or frosting on their chips!) 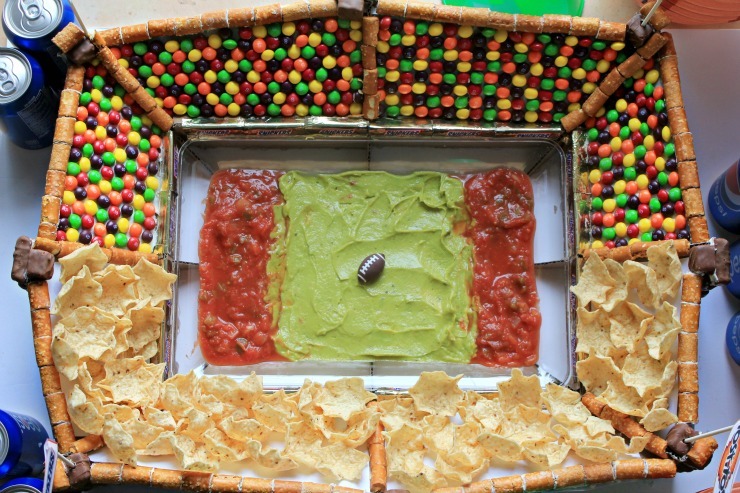 I wanted a border on my stadium so I used a rolled snack chip, spread some frosting on them and created my border. You could also create a border with candy. Now for your field. You will need a green center and two endzones. 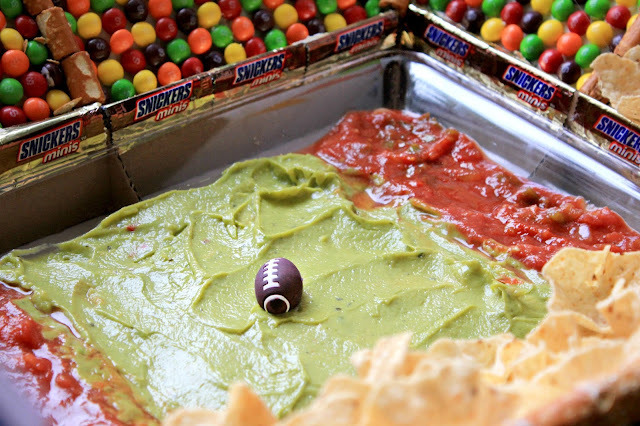 I used guacamole as my field and then my TOSTITOS® Chunky Medium Salsa as my endzones. I know it takes a long time to assemble but once this masterpiece is placed on your entertaining table, get ready for oohs and aahs and so many compliments. It is pretty impressive to admire. Hard work really pays off with this fun stadium! Which side is your favorite? Are you a big dipper? Is the field your favorite? How about the SNICKERS® towers or a cold can of Pepsi™ to wash it all down? This was by far the most fun I have ever had with a food challenge. I already have so many ideas for another stadium! I purchased everything I needed for my sweet vs. salty snack stadium at Walmart. 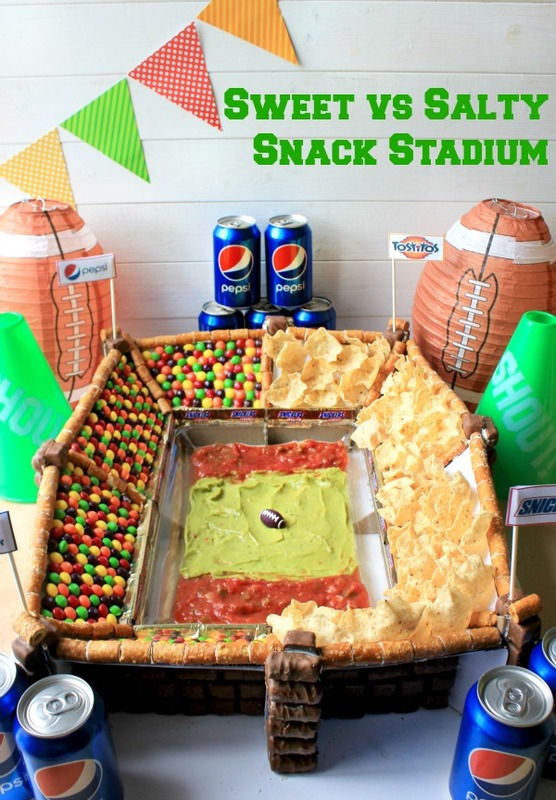 Have you ever built a snack stadium? 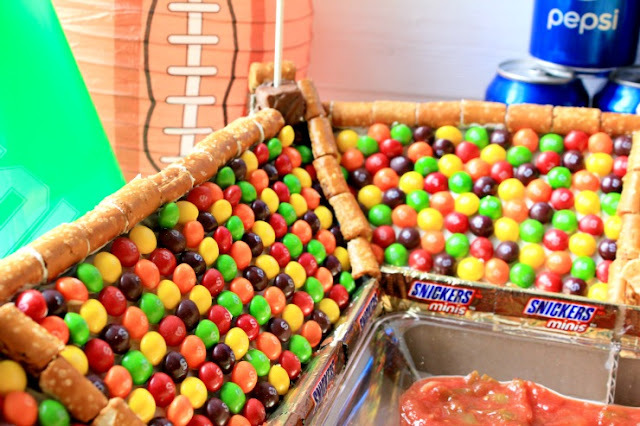 What would you use if you created a sweet vs salty snack stadium? 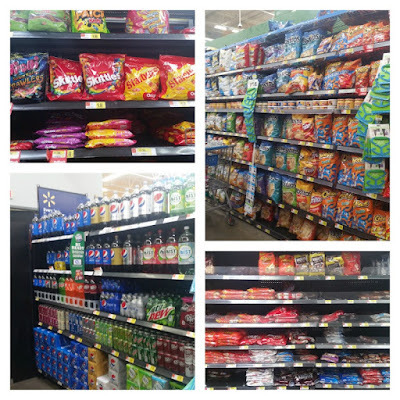 Be sure to check our more snack stadium ideas here! I love this!!! I love how you 'glued' on the candies. I wanted a similar effect with my Skittles people, so I made a bark out of it.